Experienced printers in St. Louis know how to enhance your business’s promotional campaign by using color strategically. Whether or not your business is image-based, the power of color in advertising should never be underestimated. Printed items that display a rich color tapestry encourage first-time customers to use your services. This is especially true when you sell products intended to appeal to the senses like food or even clothing. 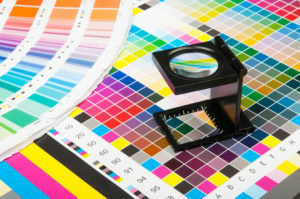 Take a look at the top printing products that utilize colors most effectively in advertising. You’ll see that traditional printing brings the richest colors thanks to advanced printing techniques and better materials. Color images are incredibly attractive on vinyl. On large banner displays, images of people and objects look practically real regardless from a distance or up close. Much of this depends on the thickness level of the vinyl as well. For outdoor use, you’ll need 13-mil vinyl. Ten-mil vinyl works well for indoor usage. Carefully consider the type of banner that will work best for your venue and the best strategic placement. Retractable banner stands are usually the best choice for smaller spaces, like trade shows or storefronts with placement restrictions. Retractable banner stands are compact and grab attention at eye level. Hanging banners—especially colorful ones—are excellent for capturing attention amid a sea of competing advertisements. With plenty of room for any kind of customized imagery, you can use a rich palette of color variety on both retractable banner stands and hanging banners. Use only the highest-quality paper to ensure that your advertisement is durable and that will allow the surface colors to pop. Vibrantly colorful printing is important. When sending out flyers in the mail, the more vibrant, the better. Direct mail tends to have heavy competition, so you need to stand out. Images and text can both be compelling. Don’t limit yourself to just images. Bright and colorful fonts can bring a stronger sense of branding. Be informational and use color to augment your message. Backgrounds behind text creates a path for the eye to lead the reader to the key message being delivered in the marketing materials. Because flyers provide a lot of ample space for imagery and text, you can surround the entire piece in bright colors. Don’t limit your creativity when it comes to color schemes on flyers: the goal is to stand out amid bland mail. Using them in your direct mail campaign. A brightly colored brochure is a unique piece of advertising mail. Use the element of surprise to your advantage. Opting for additional features. Explore different paper stocks and special coatings to make colors look even more impressive. Choosing different folds. Rather than choosing a standard fold, evaluate the information you need to convey and consider using a multiple-fold brochure. Brochures are a meaningful, compact, and effective way to showcase your imagery and text. When combined with professional color-printing techniques, you create an attractive resource of information for customers to retain. Oversize printing products can make colors look outstanding when you need to capture attention from afar. Large-size posters are a custom option that work in any setting, particularly trade shows when you have competing booths around you. A giant poster near your booth with an image of your colorful logo, a natural setting, or customers you’ve helped can intrigue those standing multiple feet away. These features are important because they’ll dictate how you well you can brand your image. Once you have a design that works, it’s recommended to print at high volume so you’ll have enough to use at other public locations, including on your own business windows or interior walls. Getting the word out about your business in a colorful way doesn’t always have to mean going large. Presentation folders are moderately sized printed products that work like a professional book. Make the customer’s decision to buy an easy one by providing appealing and detailed imagery of your products. It helps customers make informed decisions. A thorough and illustrative presentation folder may be the factor that helps a customer decide on your product over a competitor’s, about whose product they may not have as much information. Think of the presentation folder as a chance to go into richer detail about what you do in your business. During times you need to impress investors, or attract new customers, folders can tell a colorful story. Banners, flyers, brochures, large-sized posters, and presentation folders are the advertising materials that tend to use colors to the fullest advantage. 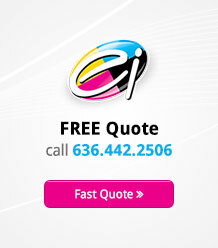 With quality color printing in St. Louis, you can showcase the best aspects of your business.